On July 11, 2005, the Cassini ultraviolet imaging spectrograph observed the star Bellatrix as it passed behind Enceladus, as seen from the spacecraft. The starlight was observed to dim when it got close to Enceladus, indicating the presence of an atmosphere, as illustrated in figure A. The ultraviolet imaging spectrograph team was able to identify water vapor as the composition of the atmosphere from absorption features in the spectrum of the star. From the depth of the absorption features, it was also possible to estimate the quantity of water vapor the starlight passed through. The colors show the undimmed star signal (blue) versus the dimmed star signal (pinkish). Enceladus' atmosphere is localized, not global in extent. As Bellatrix re-emerged from behind Enceladus, there was no dimming of the starlight observed. An occultation of the star Lambda Scorpius in February also showed no sign of an atmosphere, as illustrated in figure B. In figure A and B, the arrow marks the path of the star as it was blocked from view by Enceladus. 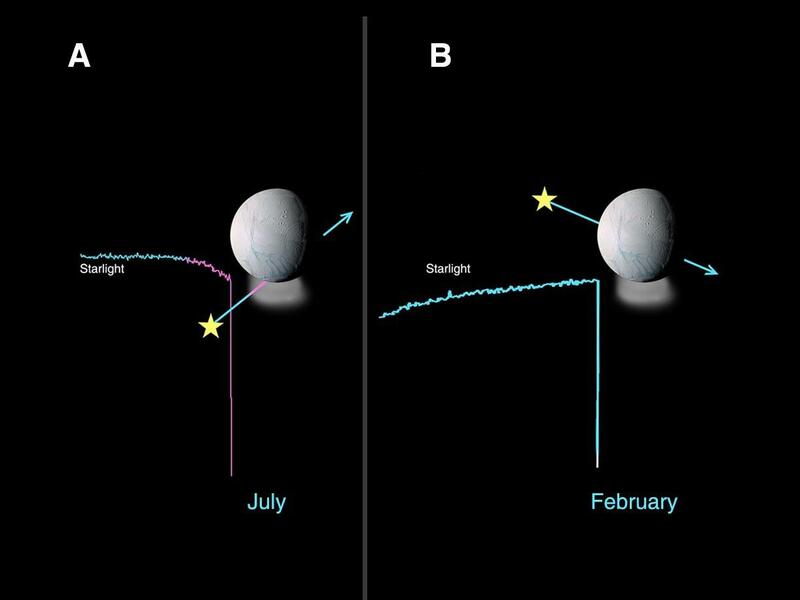 In figure A, the dimming of the starlight shows as a gradual decrease in brightness, while in figure B the starlight drops abruptly just at the point in time that the star goes behind Enceladus. The Cassini-Huygens mission is a cooperative project of NASA, the European Space Agency and the Italian Space Agency. The Jet Propulsion Laboratory, a division of the California Institute of Technology in Pasadena, manages the mission for NASA's Science Mission Directorate, Washington, D.C. The Cassini orbiter and its two onboard cameras were designed, developed and assembled at JPL. The ultraviolet imaging spectrograph was built at, and the team is based at the University of Colorado, Boulder. The imaging operations center is based at the Space Science Institute in Boulder, Colo.
For more information about the Cassini-Huygens mission visit http://saturn.jpl.nasa.gov . The ultraviolet imaging spectrograph team home page is at http://lasp.colorado.edu/cassini . The Cassini imaging team homepage is at http://ciclops.org .